If anyone can provide the last 4 tracks I can give a go at running them, don't expect a lots of pics, focussing only in the main battles of the race, so we can finally end this season and series. Where are we at with this series? I am willing to RD a race or two, to get this season over and done with. After this season though, i think i am done....if not already done if delays go on much further. We are all searching where the hell can be Marfield. Well I said at the end of last season that I didn't want to do any more track/mod/activity/table work any more since I got stuck with all of it. Yet after a few races I was doing 3/4 of them again. I might or might not prepare the 4 tracks in my week off, but that'll be it. I'll definitely be out after S6, and since I doubt someone will step up to take over the tasks, that'll be the end of the Nations Cup. I might also add somehting up, we should provide season boost plans for the remaining of the four races, so we can finish this season as fast as possible, also I don't think a new season will be on plan for next year, this is the last one. 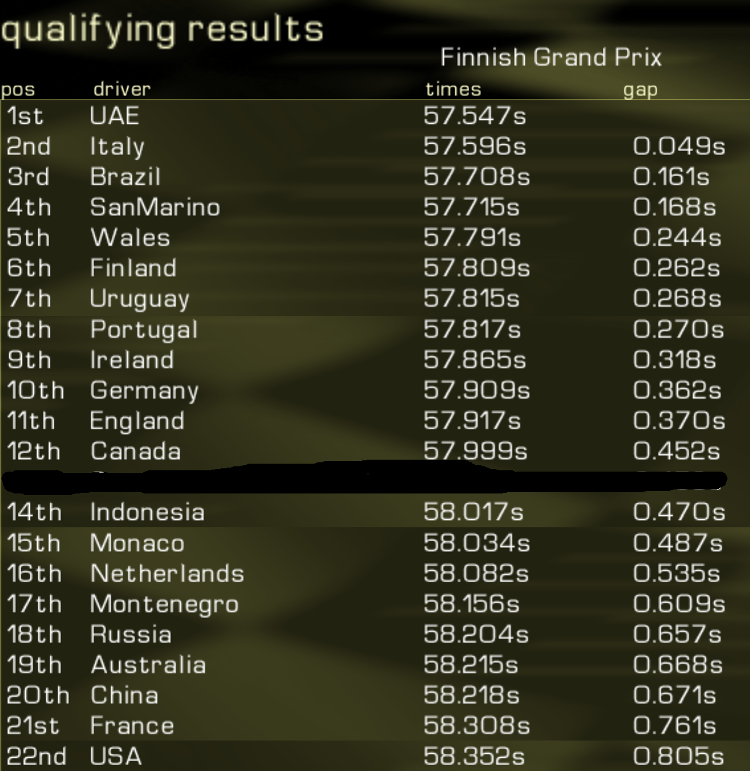 That's it, i officially declare ME the winner of this season, well done me.... USA! USA! USA! If the track can't be found then maybe we need to vote in a track to replace it. Silly me then for not seeing the post. In that case I'll go ahead and run the round if that's ok with everyone. Where is a link to the current mod? I am on holidays in a few weeks time, i might be able to RD a round or two to help close off this season. To help the series get through to the end more quickly I think it's for the best that we only post the qualifying result and keep the coverage for the race itself.